Ninja warriors were believed to be able to disappear as if leaking through the walls and cracks, to turn into the tree or a stone, or to exist like fish in water. These beliefs could be explained reasonably subject to one of Ninja school aspect based upon such skills, and called ongyo-jutsu. Ongyo-jutsu is often called differently depending on who names it and what is intended to express, among them are Ongyo-jutsu (disappearing and invisible techniques); Onshin no Ho (way to attain invisibility); Onshin Tongyo no Jutsu (techniques to get out of line of sight; skills to conceal and escape) and so forth. Preliminary, the ongyo-jutsu was classified as two categories known as hiding (inpo) and escaping (tonpo). Ninja warriors were known to be highly skilled in the art of camouflage. They trained their physical capacity to be able to control themselves and sit still for a long time to disappear and/or resemble a small tree or a bush in the moonlight. The point is the Ninja warrior tried to forget about their human body and human qualities to seem as the object he attempted to imitate so fully that he could hold breathing and stop moving for long. 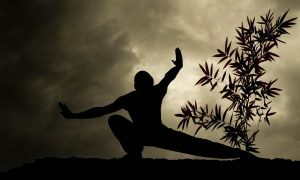 Breath control is another intriguing technique the Ninja warriors should master and apply in their missions to win. Professional Ninja could hold breathing and freeze all emotions to look and behave dead during eye inspection. The technique of holding the breath was also beneficial while doing missions under the water breathing through the reed or a bamboo pipe for significantly long time.